How do you maximize the business value of your technology? For a small business, the answer is often fairly clear, because its technology and business processes are both relatively confined in nature. Straightforward products and services suggest straightforward IT. As that business succeeds and grows, however, so will its underlying IT infrastructure. And so will its need for an adaptable approach to management. 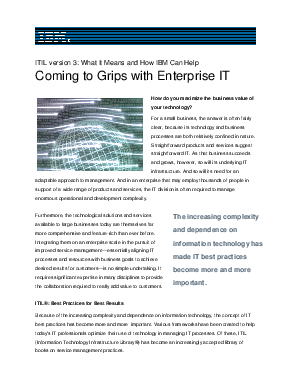 And in an enterprise that may employ thousands of people in support of a wide range of products and services, the IT division is often required to manage enormous operational and development complexity.